We all have such busy lives it’s hard to sometimes relax when your head is full of stuff that needs to be done. It is easy to be constantly connected to work and the internet it can be hard to unwind and relax. Going for a walk is my favourite thing to do each day. It declutters my brain and reorganises my todo list like nothing else! Many writers use walking as a means to day dream and help improve their creativity. Moving can help change and improveyour mood. Most of us were brought up in a multi tasking society so just walking while listening to music or a podcast may seem a good use of time. It also defeats the purpose which is to take in your surrounding and wander at your own pace, no one else’s! If it feels like you have a lot in your head, regularly writing it all down helps as you no longer need to remember it all. I use an app called Evernote which is fab as it works on my phone and my pc. A notebook is just as good if that is good for you. Whatever works for you. Mind maps are great if you are planning and brain storming a new project. Tony Buzan invented Mind maps and he describes here how to create one. Do you really need to do the task? Does the task need done at all? Doing something because we always have often means it needs reviewing. If you can’t ditch it, can someone else do it? We often won’t pass over a task because we think no one else does it as well as we do. Does that really matter? Is it a good teaching tool for someone else? Everyone knows how fab meditation is for you but not many do it. It can take many forms which can be just finding some quiet time in your day or taking the time just to be still rather than racing about. There are tons of apps to help you or you can listen to a guided meditation if you are stuck as to how to get started. We can be quite strict on junk food but not so much on limiting the junk on TV or social media. Your brain can’t tell the difference between TV and reality so watching a tragedy unfold on TV can have a profound impact even just watching it. Limiting online time can help stop flooding the brain with negative images. All phones and tablets have flight mode where you can disconnect from the internet for a while. 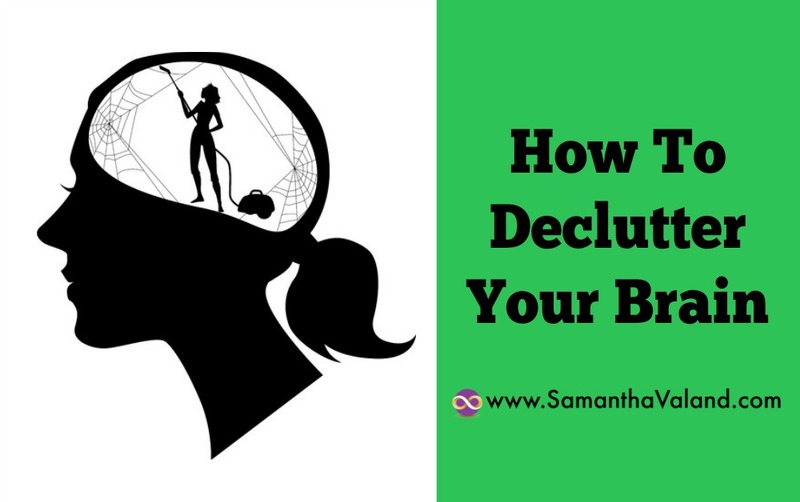 Any hobby or activity where you can lose yourself and all track of time is great to help you declutter your brain. Exercise class such as Pilates where you have to focus what your body is doing therefore your mind can’t wander off on its own! Reading novels and adult colouring books are all great for this too.